On paper, backend depth in the bullpen was supposed to be a strength for the 2011 Twins as they had Joe Nathan and Matt Capps in place to handle the 8th and 9th innings to shorten games. Of course, in reality, Nathan’s return from Tommy John surgery was predictably premature while Capps would labor through arm issues of his own, leaving the Twins short in late inning arms – particularly from the right side. Without question, the left-handed Glen Perkins filled the role admirably as the bridge to the closer, even holding righties to a bullpen-best .259 batting average against. Yet, the Twins struggled to find a suitable candidate to square off on tougher right-handed hitters – guys who could be counted on to defuse a late inning matchup with Paul Konerko or Miguel Cabrera. Over the course of the season, the team trotted out young arms in Alex Burnett (789 OPS vs RHB), Lester Oliveros (706 OPS), and Kyle Waldrop (909 OPS). While the future may prove otherwise, based on their results none of those players seemed ready to handle more critical situations. As those pitchers get the opportunity to develop in less vital roles - perhaps eventually marrying the skill with their natural talent and ascending in the pecking order - the Twins would require a more stable, more consistent right-handed member of the bullpen. That’s where the 31-year-old Todd Coffey comes in. Undervalued for most of his career and, outside of his sprint in from the bullpen, Coffey has toiled away quietly in the National League, producing splits that would make blue states proud. Over his seven seasons, he has keep righties at bay at a much better rate than lefties (.265 RH avg vs .317 LH avg). That mark has improved in the past few seasons as well. Since 2009, he’s kept righties at a .222 average. While he had been given a more balanced workload in Milwaukee, facing righties and lefties a fairly equal amount, the Nationals played more to his strength by limited his engagements with wrong-handed hitters. This meant shorter outings and more selective appearances. It appears to be an ideal fit for the Twins – someone with late inning experience, who is tough on right-handed opponents and can be lifted easily for one of the plethora of southpaws in the ‘pen (Perkins or Brian Duensing). But, is Coffey as good as advertised? Interestingly, Coffey has seen his batted ball rates change significantly in the past three years. Early on in his career, Coffey was a ground-ball inducing machine, getting grounders well over 50% of the time. In 2010, that started to dip. Last year, his ground ball rate was at a career-low 43.6%. What appears to be responsible for the decline is how he deploys his slider. 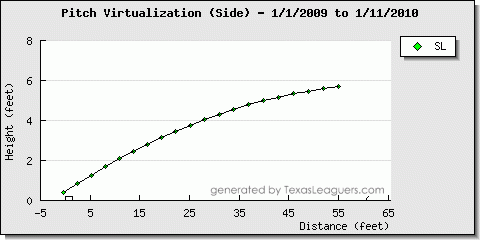 Prior to 2010, Coffey was mainly a fastball guy who occasionally mixed in his slider but in 2010, Coffey up his usage of the slider to the point where he nearly threw it as much as his fastball (likely in response to the higher amount of match-ups versus same-sided hitters). But it wasn’t just the amount that changed; it was how he threw the slider as well. In 2009, he would bury the slider underneath the zone, inciting any opponents who opted to chase after the pitch to go out of the strike zone to do so. Because of its trajectory and the fact that it was well underneath the hitting zone when it reached the plate, most hitters were forced to bat it into the ground or flail at it. 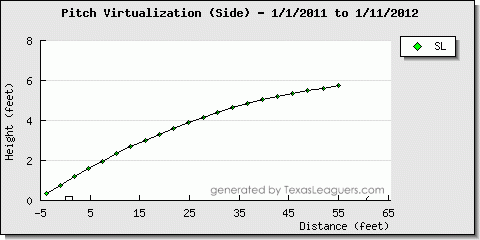 Meanwhile, starting in 2010, Coffey began to throw his slider more often for a strike. This meant in was in the zone more resulting in more contact and more elevation in said contact. 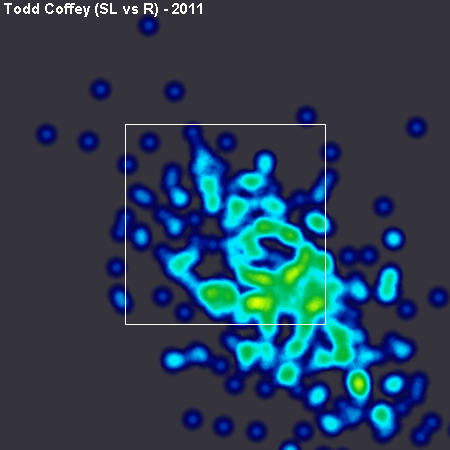 Along with the decrease in grounders, Coffey also witnessed righties hitting his offerings more solidly. According to Inside Edge’s Well Hit metric, in 2009, righties posted a .168 well-hit average. This past season, that number jumped to .221. In spite of that hard-hit rate, Coffey had a little help from his friends in the Nationals defense this year, helping convert 72.1% of balls in play into outs – also a career best. As mentioned before, Coffey has a decent fastball/slider combination that when thrown together in the right mix, he may be able to avoid getting squared up regularly. Ideally, if the Twins do sign him to subdue righties, they show him the difference in how his slider is performing and see if he can resurrected the ’09 version at Target Field. one little correction though, Esmerling Vasquez did not pitch an inning with the Twins (all his 2011 numbers are with the Dbacks.) He was picked up on waivers just after the season was over. @thrylos98 -- Thanks for calling that to my attention. Meant to delete him after a re-write.